Our department of Skin Laser is having different ranges of laser machines. They are second generation Nd YAG Laser (Neodymium) machines, Erbium YAG Laser machine, Q switched Nd YAG Laser machine, Narrow band UVB machine, Traditional Co2 Laser machine, Fractionated Co2 Laser machine and eTwo machine. 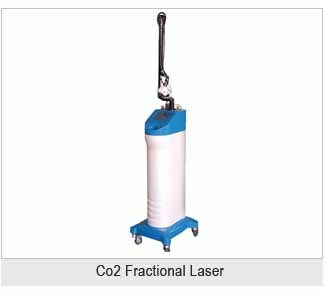 Fractionated Carbon dioxide (Co2) laser resurfacing combines the concept of fractional photothermolysis with an ablative 10600 nm wavelength. This technology allows for the effective treatment of rhytides, photodamage and scars, with shorter recovery periods and a significantly reduced side effects profile as compared to traditional Co2 laser resurfacing. Some of our Laser machines are shown in the above picture. Treatment Principle: Until recently, shaving, plucking, waxing, and electrolysis were the only methods of removing unwanted hair. In the early 1990’s, the first reports of using laser energy to selectively destroy hair follicles were published, and since the mid 1990’s, laser hair removal has become the “Gold Standard” in hair removal treatments. Laser-assisted hair removal was introduced to remove unwanted body hair over large areas of skin. Laser hair removal can be achieved in two different ways: selective photothermolysis and homogeneous photothermolysis. The principle of selective photothermolysis is based on the selective thermal destruction of a pigmented target when sufficient energy is absorbed by the target for a duration equal or less than the thermal relaxation time of the target. Because of the competition between melanin in the skin and melanin in the hair to absorb the laser energy, which may lead to hyper- or hypopigmentation, or burns, selective photothermolysis is not the ideal treatment option for darker skin types. Homogeneous photothermolysis is based on the fact that laser energy acts on a certain tissue volume homogeneously. Rapidly dividing cells with high cellular metabolism are the first to be affected by absorbed laser energy. The hair bulb cells in the anagen phase (period of active stable growth) have a high metabolic rate and are much more sensitive to heat. Surrounding tissue is preserved, while at the same time, hair follicles are irreversibly destroyed. Due to the very low absorption in melanin, competition between skin and hair pigment is less, which makes this method more suitable for darker skin types. Fotona’s Nd:YAG laser’s treatment principle is based on both selective and homogeneous photothermolysis, and thus combines the best characteristics of both. This laser source has the depth of penetration necessary to reach even the deepest hair follicles without causing any collateral damage to the skin. The 1064 nm wavelength of the Nd:YAG laser primarily targets hemoglobin, targeting the blood flow in the base of hair follicles. Because of the minimal hemoglobin elsewhere in the skin, collateral damage is reduced and thus Nd:YAG laser treatments can be administered safely and effectively for all skin types. It is important to know that in some cases an initial rise in hair numbers after the first laser treatment has been reported. It is believed that this increase occurs because of treatment induced synchronicity in the hair cycle, resulting in simultaneous anagen in the affected follicles. The initial rise will be followed by a reduction after further treatments.